This small valance or cover was displayed at the Naval, Shipping and Fisheries Exhibition at Earl’s Court in 1905 to commemorate the centenary of the Battle of Trafalgar, with a hand-written note stating: ‘Nelson’s quilt, was on Nelson’s bed on board the Victory at Trafalgar’. Viscount Horatio Nelson (1758–1805) was a British naval commander in the wars with revolutionary and Napoleonic France. He was celebrated as a national military hero, and the euphoria surrounding his success was on a scale rarely witnessed in Britain. Nelson was portrayed as not only a military but also a romantic hero and on his death, he was deeply and publicly mourned by both men and women. Relics associated with him were much prized. Unlined linen valance or panel, appliqued with printed cottons. The ground is formed from two sections of linen that have been seamed together. Appliqued triangles of printed cotton are arranged around the edges of the panel, with their peaks facing inwards. Taller flowering plants are interspersed between every four or five triangles. Between each of the flowering plants appears the outline of an oval shape composed of small oval-shaped patches. All except one of the applied cottons are block-printed. One or two pieces show the dark grounds and mossy trails of the late 1700s to early 1790s. 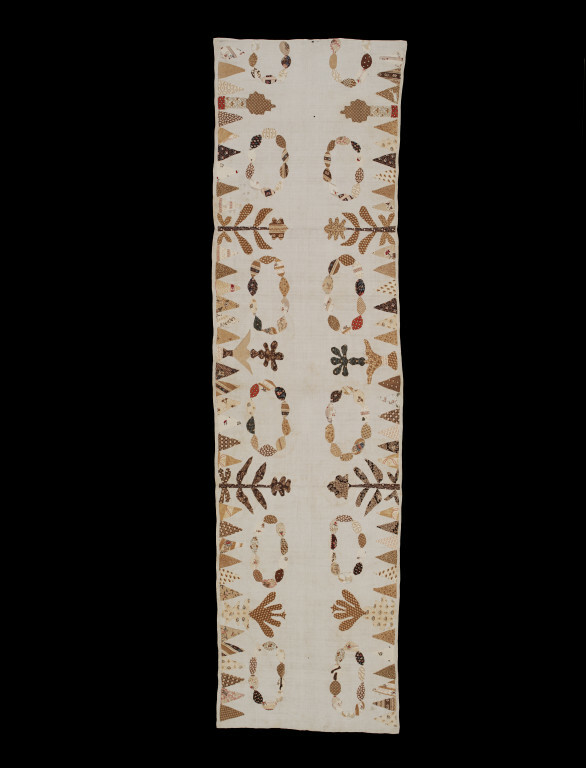 'JD yds 21' is embroidered in white cotton thread on the linen underneath one of the applique triangles, and is probably a linen-maker's mark. Four tucks have been created down the central fold of the object. Given by Miss V. Stenhouse of Willesden Green, London. According to the donor's family history, the piece was 'reputed to have been on Nelson's bed at the Battle of Trafalgar'. Historical significance: Celebration and commemoration in the nineteenth century took many form. Public admiration for Horatio Nelson became a cult in the early years of the century, and a range of decorative items, made commercially and by amateurs, was produced in homage. 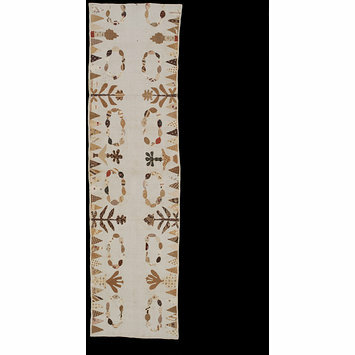 These included both printed textiles, and domestic objects such as this valance. Displayed in the 'Historical and Relic' section of the Naval, Shipping and Fisheries Exhibition of 1905 to commemorate the centenary of the Battle of Trafalgar, with a handwritten note stating 'Nelson's quilt, was on Nelson's bed on board the Victory at Trafalgar'. The object was in the possession of Miss Stenhouse's father at the time. 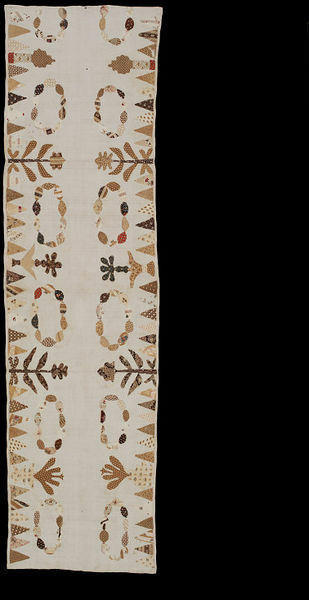 Valance of linen with appliqué of printed cotton, England, 1775-1805. Featured in the catalogue for the Naval, Shipping and Fisheries Exhibition at Earl's Court in 1905. Exhibit no. 106, page 51. This valance was last displayed a century ago at the Naval, Shipping and Fisheries Exhibition (1905), held at Earl's Court to commemorate the centenary of the Battle of Trafalgar and the victory of Admiral Horatio Nelson (1758-1805). Pinned to the object was a label stating: 'Nelson's quilt, was on Nelson's bed on board the Victory at Trafalgar'. This story is impossible to verify, as relics associated with Nelson were eagerly sought and many appeared after his death.